The War of the Rebellion (American Civil War) is more than a hobby for us. It's a passion. We will try to tell you the story of these men through our pictures and our research. If your interested in joining,Contact us. As you can see we have added some more pages to the web site. Weapons page is now finished, follow links to view. Updated Roster information (some pictures found. Uniform's research has been completed. Chausser Trousers & Fezs by Timeless Stitches (see links page). Vests, Jackets, Sashs, & Gaiters by Linda Guiot and Anna Frail. Biography Pages of men have been started. 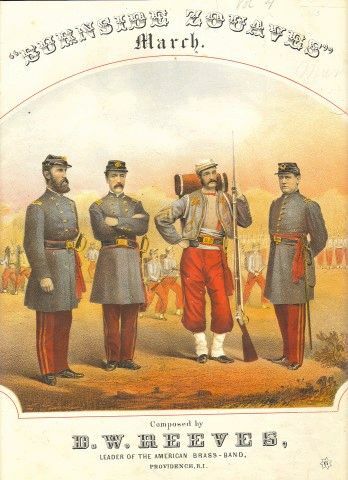 Military Services records have been copied from the National Archives in Washington DC for every member of the Burnside Zouaves that served during the American Civil War. Pension records are being copied now. We started this web site in 2005 with an idea & desire to learn more of these men, it is now 2012 as I add this, we have the uniforms completed and six men as a Color Guard. If you are interested in learning more about our Color Guard, please contact us. close but inaccurate, whats incorrect? 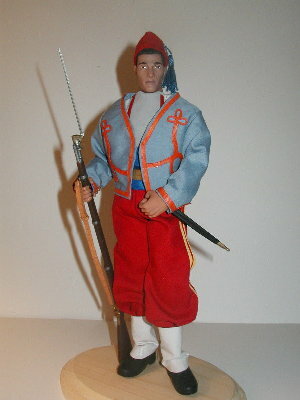 Below picture was used for doll, incorrect again. The bib, trim, and tessel are wrong. Thanks for dropping by and taking a look at our photos. Please get in touch with any comments or reactions! copy right laws of the United States. If you know of any other men who served with the zouaves as part the 10th Reg RI Inf Co H. and have supporting documents please contact us.